A constant supply of fresh water is essential to your dog’s good health and comfort. Water is very important, representing and estimated 70 percent of the dog’s weight. Like man, a dog can go without food for a surprisingly long time, but if he is deprived of water, he can’t survive for more than a few days, or even hours, in a hot, dry environment. A dog’s water consumption varies according to the climate to his activity, and to the composition of his meals. Heat and exercise dehydrate him quickly. He gets very thirsty in cars or any confined space. However, excessive thirst for not good reason should be reported to your vet, because it may be an early symptom of diabetes or kidney trouble. At home he should have a clean, full water bowl next to his food dish, another in his play area, and possibly a third one that is accessible at night. Away from home the problem is more difficult. A thirsty dog is attracted to water in the gutter, in stagnant pools and rain puddles. Clean rain water is fine, but hard to find. Caustic chemicals used to melt snow on streets and sidewalks, weed-killers and insecticides on lawns and golf courses contaminate most standing water and should be avoided. 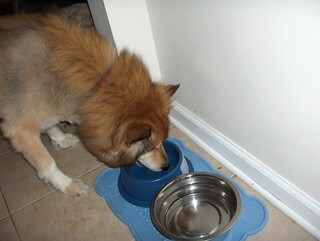 Try to train your dog to drink only from his own bowl or what you offer him. Try to keep a water-filled plastic container with you or in your car, especially if you plan on a lot of walking or running during hot weather. Milk is the only liquid, aside from water, that appeals to dogs and still agrees with them, (although it may cause loose stools). They are seldom tempted by other drinks and particularly dislike carbonated drinks. Milk is always another good source of protein but should not be used as a substitute for meat. Most any flavored drink should be avoided, as it only tends to irritate the kidneys, causing frequent urination and dehydration. Keeping up with your pet supplies can be just another thing you don’t want to have to remember. After a long day at work and going to the store, the last thing you want to do is have to go “to the store” again. Consider home delivery of your pet supplies!